Cranberries are beginning to appear in the produce section at my supermarket. I remembered seeing a recipe for Cranberries with Prunes in a 1915 issue of Good Housekeeping, and just had to give it a try. 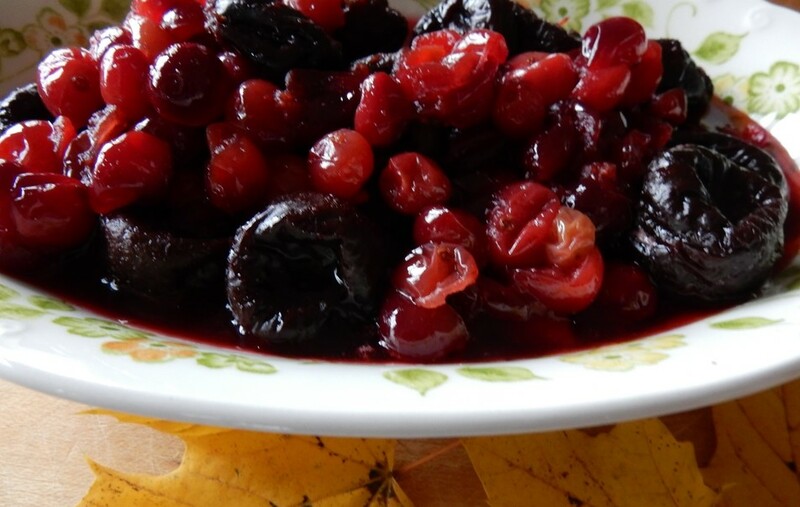 Cranberries with Prunes are a lovely taste treat with bright notes of both fruits. The rich sweetness of the prunes mingles with the tart cranberries to create a vibrant mixture. Like many hundred-old-recipes, this classic recipe is simple to make with only four ingredients. This recipe combines two super foods. Both cranberries and prunes are noted for having lots of antioxidants, fiber, and other good things. Amazingly, even though terms like antioxidant were unknown to cooks a hundred years ago, people seemed to have an intuitive sense of healthy food combinations. Combine cranberries, sugar, and water in a large saucepan. Bring to a boil using medium heat; then reduce heat and simmer until cranberries burst. Add prunes and remove from heat. Cool before serving. I’m often amazed how foods and cooking techniques have changed over the past hundred years. As with many old recipes, I needed to adapt this recipe. The original recipe provided detailed directions for preparing the prunes. Cover the prunes with water and soak overnight. Simmer gently till thoroughly tender. Take up with a skimmer, and when perfectly cool slip out the stones. Add the cranberries to the water in which these were boiled, pouring in more water if necessary. . . The prunes I used were already pitted and very moist, so there was no need to soak them overnight or to pit. Posted on November 2, 2015 November 1, 2015 by SherylPosted in FoodTagged cranberries, prunes, recipe. Reading old recipes is a perfect way to see how much the world has changed in one hundred years! I agree! Some of the foods and cooking techniques that seem very basic now were different back then. I have really been trying to eat better lately – this is a great idea!! This looks wonderful. i wonder if i could serve this for Thanksgiving and just forget to tell the family that there are prunes in it? You’re a wonder. I can barely figure out what to do with modern recipes. I admire you for interpreting these old ones! When I saw the title of this one, I thought, “No kidding!” I never would have thought of combining these, but it’s an inspired idea. It certainly would do very well as a cranberry sauce, too. I grew up with the jellied sauce that came to the table still bearing the marks of the can, and canned whole berry sauce. I didn’t really develop an appreciation for the fruit until I started using the fresh ones. I grew up with the jellied kind that came in a can, too. I think that it was considered the “modern” way to serve cranberries back then. It seems strange how wholesome foods seem like they often got lost in the rush towards modernity and convenience in the middle part of the 20th century. Cooks used prunes often back in the day. I saw a recipe for a prune sandwich. hmm. . . I can’t quite picture what a prune sandwich would taste like. Like you, I’ve noticed that prunes (and other dried fruits such as raisins, figs, and dates) were very popular back then. It probably was difficult to transport many of the fresh fruits over long distances in the early 1900s. My mouth is watering!!! This is going on my grocery list!! I made with and it’s wonderful!!!!!! It’s wonderful to hear that you liked it. Thanks for letting me know that you made it. Yum – could be very nice over plain Greek yogurt. I like your suggestion. It sounds wonderful. I’m going to have to give it a try. What an interesting combination! I have a recipe that combines eggplant and plums which turned out to be a surprisingly delicious merger. You’ve got me curious now. I can’t quite picture eggplant and plums. It’s wonderful to hear that you like to read these old recipes. I can imagine this as a wonderful topping or a sauce. I haven’t tried it, but I think that you are absolutely right that it would make a nice topping or sauce. MMM… perhaps on angel food cake (to counteract the nutritional value, of course). This sauce looks delicious. I love the bright colors! I have kind of forgotten about prunes, but this makes me want to buy some and try this recipe. The vibrant reds and purplish blacks in this dish work together to create a beautiful food. It is a nice way turn a Thanksgiving classic into a “new” and interesting food. I completely agree! I plan to try it. I’m so glad you shared the recipe. I was told to eat 3-5 prunes a day and all problems will be solved. I doubted it. Wonderful way to eat prunes. I love cranberries and enjoy cooking them fresh. Wonderful addition to my recipe memory bank. Yes, eating prunes solved some problems. All of them was too much to hope for…right? 🙂 It’s nice to hear that you’re adding this to your recipe memory bank. An intriguing and inspired combination. Would love to try this when the cranberries come into season here. It’s wonderful to hear that you enjoy them. Sheryl, are these fresh cranberries from the produce section or a farmer’s market? sigh. . . I wish they sold cranberries at the farmers’ market here. I used cranberries from the produce section at the supermarket. I bought one bag of cranberries–it contained about 3 cups of berries.